DOCTOR WHO: Titan Comics – Twelfth Doctor #4 "The Swords of Kali, Part 2" Review | Warped Factor - Words in the Key of Geek. The Twelfth Doctor’s a deceptive character to get a hold of. After the rent-a-gob chatter-factory of the Tenth and the thing-in-progress elastic giraffe of the Eleventh, the more acid, taciturn Twelfth is sometimes an awkward match for the fundamental Doctor – the good, the kind, the righter of wrongs. If this is true in three dimensions on the TV screen, how much harder is it to get the balance of his character right in two dimensions, in a comic book? Harder than Titan Comics makes it look, in all probability. Happily, Robbie Morrison, Titan’s author of The Swords of Kali, has quickly gotten to grips with the balancing act of the Twelfth Doctor’s character, meaning the story in The Twelfth Doctor #3 and #4 brings Capaldi’s Doctor confidently to life. The storyline is rather complicated, mixing time periods, and showing some of the history of a new companion of a Classic Doctor – always a delight to fans, discovering a new chunk of our previous Doctors’ lives. Underneath the complexity of the plot, there are beautifully simple social themes at play here though – a loving relationship between two women being probably the main one, taking up a few early pages of #4, and being rendered with a mixture of stylistic choices that feel very well suited to the story – including a kiss in silhouette. Very Valentine’s Day. There’s a stylish brand of storytelling in this offering, mixing sci-fi and religion at various points in Indian history, and bringing mythological beasts to life in service to a ‘goddess’ who, almost like the Seventh Doctor’s Nemesis, needs a critical mass of ‘the swords of Kali’ to be complete. There are nods to the TV Twelfth Doctor’s tone too, with talk of a ‘necro-cloud’ full of the ‘spirits’ of the dead, and some very Capaldi lines – ‘If you want to get philosophical about it. Please don’t.’ What becomes clear as you read is that Morrison’s a writer unafraid to give us complex tales, real, experience-damaged people, a truly unprincipled villain, (which given the recent moral equivocation about the Doctor being ‘a good man’ is an enormous relief), and a heaping dose of classic technobabble. We’re in Satan Pit territory here, which is rarely a bad thing – aliens working their way into a religious mythology over hundreds and thousands of years, converting the life force of their followers into energy to sustain themselves. We’re also in territory that feels both classic and utterly modern; fitting with comic book tradition the current, ongoing Doctor is allowed to have his current TV companion with him, and Clara’s in typically fighting form here: stranded in one time period while the Doctor’s in another, she cheerfully throws multi-armed alien aggressors through windows and, when captured, tell them that they need a shower. It all feels true to Coleman’s developing portrayal of the character, and delivers a real second strand to the story. While there’s a lot going on, the backstory and exposition are handled, as in recent TV episodes, either by narrated ‘memory’ sequences, or on the move, the Twelfth Doctor rarely standing still for long, and doing a handful of things at once. The action moves to an inescapable but reasonably familiar cliff-hanger: you see it coming, but when it happens, it still packs a punch. The reason it does that is a combination of the energy of the storytelling winding up and up towards only one thing that makes sense, and the superb artwork in this issue. 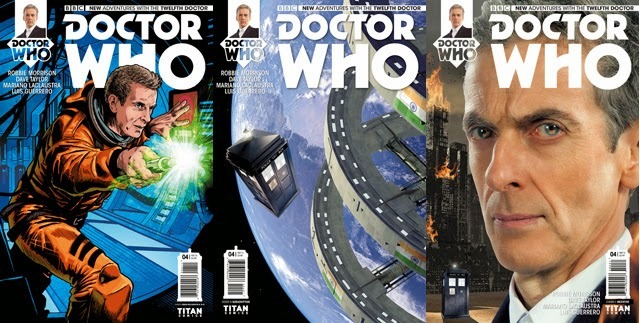 Whereas, for instance, the Tenth Doctor comics have yet to fully capture the essence of the character in the artwork, the Twelfth Doctor artists, Dave Taylor and Mariano Laclaustra, have captured both lead characters beautifully in most of their panels, but also taken time out to give us vivid colour work (as you’d perhaps expect from a tale of Indian gods) and startling set-piece shots – the Angry Eyebrows get a couple of panels to themselves in close-up as the story runs along and Mr Frowny-Face is called for. The artwork in the ‘narrated memory’ sequences is beautiful and functional at once, while shots of A Big Plot-Point Thing are allowed most of a page of space, just to let you drink in what you’re dealing with here – a combination of what would be long-shot and CGI, but rendered beautifully in two dimensions. There’s a great, albeit moderately disturbing quarter-page shot of one of the multi-armed aliens, using perspective to create a kind of 3D effect as it reaches out of the pages of the comic book towards the reader, and even an inverted, clinging to the ceiling villain-point-of-view shot of our fleeing heroes. This sort of thing might sound pedestrian, but it adds camera angles and energy to Morrison’s storytelling and lifts it to a whole other level. The final two pages, delivering that cliff-hanger, are particularly exquisitely drawn and coloured – in one particular panel you wonder if you’re just seeing comic book excess made real, but no, the final panel revels in detail and darkness, giving you the full horror of the image you weren’t sure you’d seen. Proper, juicy, cliff-hanger stuff, this, that makes you tick days off your calendar till the next issue’s out and you can find out what happens next – you know, just like comic books used to do when you were a kid. Titan Comics is clearly aiming to add substantively to the range of adventures the New Who Doctors have, and with The Swords of Kali we get to see a journey that’s unlikely ever to have made it to the screen, and relatively unlikely to have found a way to deliver its unique visual elements on audio either. There’s a tight grip on the Twelfth Doctor and Clara as they appear on the TV, and a broader canvas on which to show multiple character-backstories. The artwork here is sublime to boot, so it’s as close to extra adventures with the current Tardis team as you’re going to get until Series 9 lands. Pick up The Swords of Kali in The Twelfth Doctor #3 and #4 now. #5 – coming soon!